One toad can eat hundreds of insects per night, but toads need to be protected from predators and the sun during the day. 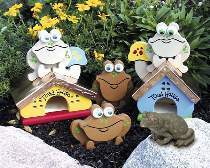 Although we designed these toad houses as a decorative accent to your garden, they truly are functional. Toads will crawl into these houses for protection. You get plans for two different toad houses and all four toad figures pictured. Order one pair of eyes for each toad you make and one fiberglass rod for each Garden Stake Toad. One roll of copper foil will cover three toad houses. Attach copper folil with brass esctcheon pins. All patterns drawn FULL SIZE.